Valentine’s Day. While I have no romantic love in my life currently, I do have the most pure, strongest, passionate type of love imaginable: The love of a mother for her children. As I watched my youngest son riding his bike down our road heading toward his school, I was overcome with tears and emotion. His strawberry-blonde, golden eyed, freckled face smiling back at me. My God, I thought, I love that little boy so very deeply…and one day it won’t just be me watching him riding his bike to school, it will be me watching him go off as a young man into the world for himself. And then the tears really flowed. 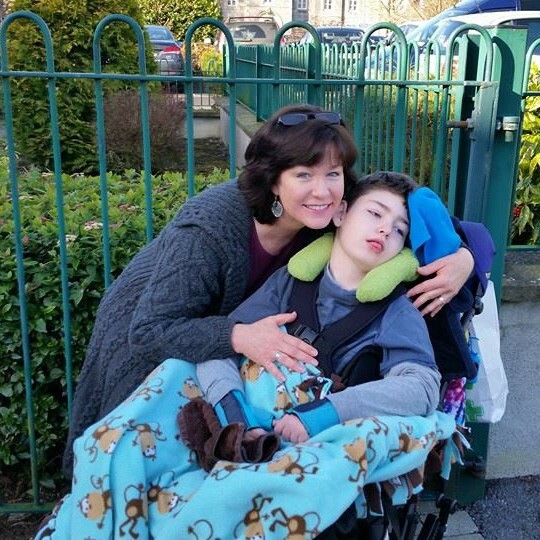 Five minutes later, the van arrived to pick up my older son, Brendan Bjorn, my son who is severely disabled with profound medical care needs and has a life-limiting condition. I stroked his hair before I put his hat on his lovely head, and he looked up at me with that smile that lights up my world. He doesn’t have words, but none were needed. He loves me and through his eyes he told me so. My God, I thought, I love that little boy so very deeply…and one day it won’t just be me watching him leave in a van to school, it will be me watching him go forever as he gains his angel wings and transcends the confines that cruelly restrict him now. And then the tears really flowed. Valentine’s Day. I have my own struggles to be sure, as the life of a full-time, lone parent carer is anything but easy. But I also have love, and it is Because of Love that everything is made worth doing. All the struggles, the sacrifices, the fights for services, the tears, the pain – it is all done Because of Love. And if I can give back to my two sons even a fraction of the love they give to me, than that is more than enough to fill my heart.